Tracie's Ramblings: Some finished objects finally! 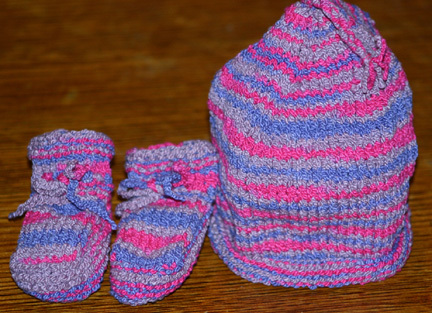 This is the finished bootie and hat for Niece #5 who arrived on November 10th. Grandpa flew them and the diaper bag sweater out to her and delivered them in person! Thanks Grandpa! They were made with one ball of the Fixation yarn from the LYS. They are newborn sized. I even have some scraps leftover. I really need to find all my Fixation scraps and make a scrappy hat for someone. Things have been nuts around here lately. It's amazing how far behind you get when you leave for a week - and then of course there's getting ready to host Thanksgiving. It's all good though, it's nice to have family and friends spend a day enjoying good food and wine. Last Minute Stripes is complete!